The Website is only for the personal use of individuals 18 years of age or older who reside in Canada. Upon registration, you will have a unique username which will be the same as your e-mail address. Christian Louboutin will allow you to choose a password to be used in conjunction with your username to access the Website. You are not authorized to access the Website through use of any username and password other than the one under which you are registered. (iv) accept full responsibility for all consequences of all actions initiated and all conduct that occurs under your username and password. (vii) constitute or contain false or misleading indications of identity, origin, endorsement or statements of fact. Nothing in this Agreement shall require Christian Louboutin to monitor or edit the Website for objectionable or infringing materials. If at any time Christian Louboutin chooses, in its sole discretion, to monitor or edit the Website, Christian Louboutin nonetheless assumes no responsibility for any submission by users unaffiliated with Christian Louboutin (“Users”), no obligation to modify or remove any inappropriate materials or information, and no responsibility for the conduct of any User. Christian Louboutin does not endorse and has no control over what Users post or submit to the Website. Christian Louboutin reserves the right, in its sole discretion, to reject, refuse to post or remove any submission, posting or other data, in whole or in part. You understand and agree that Christian Louboutin has no liability whatsoever if it refuses to post your submissions or edits, restricts or removes your submissions. Christian Louboutin does not claim any ownership rights in any audio, images, software, text, artwork, video clips and other materials (“Content”) that Users upload, transmit or post to the Website (“User Content”). However, by uploading Content to the Website, transmitting Content through using the Services, or otherwise providing Content to Christian Louboutin, you grant Christian Louboutin a world-wide, royalty-free, non-exclusive, perpetual, irrevocable and sublicensable license to use, modify, publicly perform, publicly display, reproduce and distribute the Content in the course of offering the Website and/or the Services without any corresponding compensation to you or to any other individual. Christian Louboutin will treat any User Content as non-confidential and public. Please do not submit confidential or private information. You also agree that any other User of this Website or the Services may access, view, store or reproduce any of your Content for such User's personal use or otherwise in connection with use of the Website and/or the Services. User Content should not be accepted or construed as professional advice or instruction. The Website also contains content owned by or licensed to Christian Louboutin ("Christian Louboutin Content”). Christian Louboutin owns and retains all rights in Christian Louboutin Content including all intellectual property rights. Christian Louboutin hereby grants you a limited, revocable, nonsublicensable license to reproduce and display Christian Louboutin Content (excluding any software code) solely for your personal, non-commercial use to view the Website and otherwise as necessary to use the Services. Otherwise, you shall not copy, capture, reproduce, perform, transfer, sell, license, modify, manipulate, create derivative works from or based upon, republish, upload, edit, post, transmit, publicly display, frame, link, distribute, or exploit, in whole or in part, Christian Louboutin Content. If you download any Christian Louboutin Content from the Website, you may not remove any copyright or trademark notices or other notices that accompany it. Except as set forth above, nothing contained in this Terms Use shall be construed as conferring by implication, estoppel or otherwise any license or right under any trade secret, patent, trademark, copyright or other intellectual property right of Christian Louboutin or any third party. All licenses not expressly granted by Christian Louboutin are reserved. (iii)attempt to gain unauthorized access to other computer systems through the Website or the Services. You further agree that you shall not attempt (or encourage or support anyone else's attempt) to circumvent, reverse engineer, decrypt, or otherwise alter or interfere with the Website or the Services, or any Content, or make any unauthorized use thereof. You agree that you shall not use the Website in any manner that could damage, disable, overburden, or impair the Website or interfere with any other party's use and enjoyment of the Website or any of the Services. You shall not obtain or attempt to obtain any materials or information through any means not intentionally made publicly available or provided for through the Website. (ii) copyright-protected graphic images including, but not limited to, photographs and other visual depictions of Company products (“Images”) found on the Website. All of the Marks and Images are owned by, or licensed to, or otherwise authorized for use by Christian Louboutin. By making them available on the Website, Christian Louboutin is not granting you any license to utilize the Marks or Images. You acknowledge and agree that you have no rights, title, or interest in or to the Marks or the Images and that you will not adopt, use, or attempt to register any of the Marks or Images or any mark or image confusingly similar to or derived from any of the Marks or Images. (iii) a description of the location on the Website of the material that you claim is infringing, as well as the date and time of the alleged infringement. Internet transmissions are never completely private or secure. You understand that any message or information you send to this Website or through the Services may be read or intercepted by others, unless there is a special notice that a particular message is encrypted. Sending an e-mail message to Christian Louboutin does not create any reciprocal obligation or responsibility of Christian Louboutin to you. The creation and operation of a hyperlink to this Website can only be made with the prior written authorization of Christian Louboutin. However, Christian Louboutin may, without notice and in its sole discretion, temporarily or permanently, at any time, revoke any such authorization without any liability. The Website may contain links to other Internet sites or be accessible through links from other Internet sites on the World Wide Web. Christian Louboutin provides and allows such links for your convenience only, and is not responsible for the content of any website linked to or from the Website. Links from the Website to any other website do not indicate that Christian Louboutin approves of, endorses, sponsors, or recommends that website. Christian Louboutin disclaims all warranties, express or implied, as to the accuracy, legality, reliability, or validity of any content on any other website. 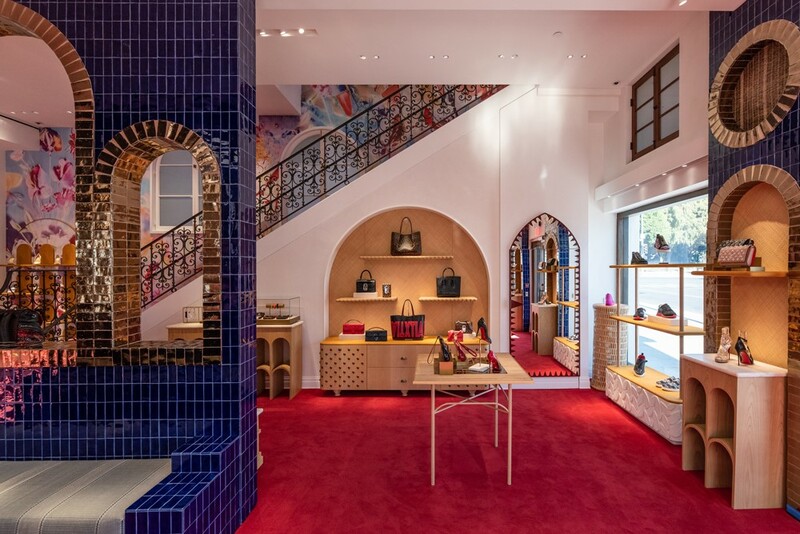 Christian Louboutin attempts to provide accurate descriptions and visual representations of all products displayed on the Website. However, Christian Louboutin makes no representation or warranty whatsoever as to the reliability, accuracy, timeliness, usefulness or completeness of any information or graphic images on the Website or available through the Services. The products and Services offered on the Website may not be available or accessible in your particular state or locality. Furthermore, Christian Louboutin reserves the right to alter, modify, add or discontinue completely any of the products or Services, temporarily or permanently, at any time, in its sole discretion, without notice and without liability. The products offered for sale and sold through the Website are intended for your personal use only, and not for resale. By placing an order through the Website, you warrant that you are purchasing the product(s) only for personal use. Christian Louboutin, in its sole discretion, reserves the right to refuse to fill any orders which it believes are intended for resale. YOUR USE OF THE SITE AND THE SERVICES IS AT YOUR OWN RISK. THE SITE (INCLUDING ALL CONTENT AND FUNCTIONS MADE AVAILABLE ON OR ACCESSED THROUGH THE SITE) IS PROVIDED “AS IS.” TO THE FULLEST EXTENT PERMISSIBLE BY APPLICABLE LAW, CHRISTIAN LOUBOUTIN DISCLAIMS ALL WARRANTIES, EXPRESS OR IMPLIED, INCLUDING, BUT NOT LIMITED TO, IMPLIED WARRANTIES AND CONDITIONS OF MERCHANTABILITY AND FITNESS FOR A PARTICULAR PURPOSE, WORKMANLIKE EFFORT, TITLE, AND NON-INFRINGEMENT. FURTHERMORE, CHRISTIAN LOUBOUTIN DOES NOT WARRANT THAT THE SERVER THAT MAKES THE SITE AVAILABLE IS FREE OF VIRUSES OR OTHER HARMFUL COMPONENTS THAT MAY INFECT, HARM, OR CAUSE DAMAGE TO YOUR COMPUTER EQUIPMENT OR ANY OTHER PROPERTY WHEN YOU ACCESS, BROWSE, DOWNLOAD FROM, OR OTHERWISE USE THE SITE OR THE SERVICES. UNDER NO CIRCUMSTANCES, INCLUDING, BUT NOT LIMITED TO, THE NEGLIGENCE OF CHRISTIAN LOUBOUTIN, ITS AGENTS OR SERVICE PROVIDERS, SHALL CHRISTIAN LOUBOUTIN, ITS AGENTS OR SERVICE PROVIDERS BE LIABLE FOR ANY CONSEQUENTIAL, DIRECT, INCIDENTAL, INDIRECT, PUNITIVE, OR SPECIAL DAMAGES THAT RESULT FROM (A) THE USE OF, (B) THE INABILITY TO USE, OR (C) ERRORS OR OMISSIONS IN THE CONTENTS AND FUNCTIONS OF, THE SITE, EVEN IF CHRISTIAN LOUBOUTIN OR ANY OF ITS AGENTS OR SERVICE PROVIDERS HAD BEEN ADVISED OF THE POSSIBILITY OF SUCH DAMAGES. SOME PROVINCES DO NOT ALLOW THE EXCLUSION OR LIMITATION OF CONSEQUENTIAL OR INCIDENTAL DAMAGES, SO THE ABOVE LIMITATION OR EXCLUSION MAY NOT APPLY TO YOU. IN NO EVENT SHALL THE TOTAL LIABILITY OF CHRISTIAN LOUBOUTIN, ITS AGENT OR SERVICE PROVIDERS TO YOU FOR ALL DAMAGES, LOSSES, AND CAUSES OF ACTION (WHETHER IN CONTRACT OR TORT, INCLUDING, BUT NOT LIMITED TO, NEGLIGENCE OR OTHERWISE) EXCEED $100.00.